Recently I did something very unusual for me and bought a green nail varnish. I don't have anything against blue and green nail varnishes, but in general I just don't like the look of them on me. Some greens aren't too bad, but in general any blue shade is a no go. On a recent Boots trip my eye was drawn to a display of Barry M's new Silk nail paints. I had spotted them popping up on some blogs but I didn't have any intention of trying any of them as I'm not usually a huge pastels fan and I thought they just looked like standard shimmers. However they did catch my eye and strangely the shade that stood out to me the most was a green shade. When I applied it to my nails I completely fell in love and decided that I needed to grab some more shades while Boots still had their 3 for 2 offer on. Just look at them, how beautiful are they?! Although I have inherited some Barry M nail varnishes from a friend of my mum I haven't actually tried any of them, so this was my first experience with Barry M, and I have to say I'm very impressed. There's also a blue shade available, which I'm afraid didn't win me over, and a kind of light brown colour that I didn't think was as pretty as the ones I've gone for. The brushes are quite thin, which I thought I might find a little annoying, but actually I really liked it. The formula is not to thick or too thin and it applies really nicely, not gloopy or streaky in any way and I found they dried quickly too. Although I thought these might just be like most shimmer varnishes they do actually look like you've applied a pretty piece of silk over your finger nail. They dry to a kind of matte finish, even though they do contain shimmer, but obviously you can apply a top coat to make them glossy, which looks super pretty. You could definitely get away with two coats of this but I like to go for three to make sure it's perfect and the third coat just brings up the colour a level so you can see it more. I was also impressed by the staying power. A lot of nail varnishes chip on me within 24 hours, even one's that are supposed to be long lasting, but these got to 24 hours without a chip in sight. In fact they got to 72 hours without a chip in sight or even any apparent tip wear, but then I got bored and picked them off (I will overcome this habit at some point!). Inspired by all the prettiness and the little bit of sun we've seen recently I decided to go for some 'hello spring, it's nice to see you' nail art. My inspiration for this nail art came from Hannah over at Love Icon Fantasy Ego. Spotting it on Hannah's blog I thought it was such a pretty look I knew I wanted to give it a try myself and the silk nail paints seemed perfect for trying this out. 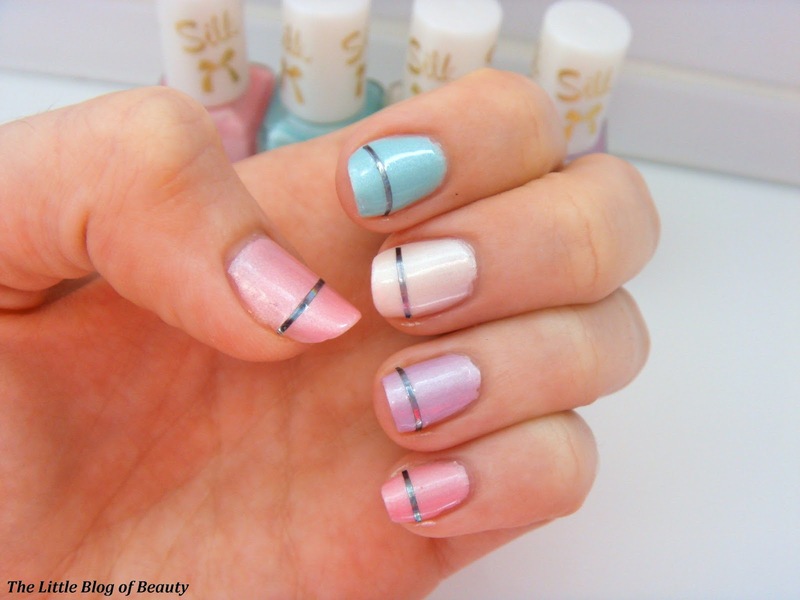 They look very pretty and dainty on the nails on their own but applying the black stripping tape over each nails sharpens them up a bit and makes them stand out a bit more. 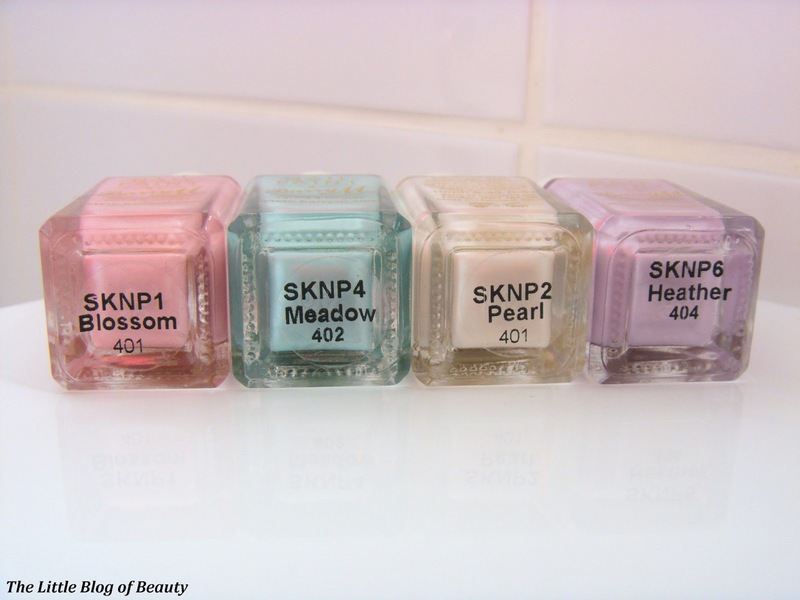 I'm sure I'll be wearing these nail varnishes a lot of through spring/summer. The Barry M Silk nail paints are just £3.99 each. Have you tried any of them yet? I really like these - I'll be sure to try them soon!